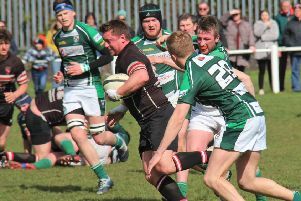 Keighlkey v Brods'Michael Briggs scoring our final try. Old Brodleians will need to steady the ship at home to North Ribblesdale on Saturday after back to back defeats. A 26-21 defeat at Keighley at the weekend followed their Yorkshire Shield exit at Hullensians, where their five-game winning run was ended by a 34-7 defeat. The second-placed Brods left themselves too much to do at Utley in a fast-paced contest played in excellent conditions. They fell behind after only three minutes when stand-off Alex Brown chipped ahead and touched down, adding the extras. The Woodhead men were soon on terms, Dom Georgiou cashing in on Keighley mistakes in midfield. Oliver Akroyd added the goal. Brods had the upper hand up front but Keighley were strong at the breakdown and regained the lead through a Brown penalty after half an hour. Good handling from the hosts set up a try for winger Jack Atkinson and Brods were forced to hang on, Leigh Sugden being held up over the line. A Brown penalty after a high tackle made it 18-7 at the break and Dan Snowden crossed to further increase the size of Brods’ task. The visitors, trailing by 16 points, could have conceded more points before suddenly finding some form. Winger Tom Wilson scored after a break from defence and replacement Michael Briggs went under the posts, Akroyd adding both conversions to cut the gap to two points. But that was as close as Brods got with Brown kicking his third penalty and Brods having to settle for a losing bonus point.